Pursuant to section 104 of the Presidential $1 Coin Act of 2005 (Public Law 109-145), the Board of Governors of the Federal Reserve System is required to assess and submit an annual report to the Congress on the remaining obstacles to the efficient and timely circulation of $1 coins; to assess the extent to which the goals of consultations with industry representatives, the vending industry, and other coin-accepting organizations are being met; and to provide such recommendations for legislative action as the Board may determine to be appropriate. At these meetings, industry representatives indicated that the Presidential $1 Coin Program had worked very well, that the coins were easy to order, and that our communication about program dates and changes was effective. Participants indicated that transactional demand for $1 coins has not increased since the start of the program and that overall demand continues to come primarily from collectors. Most meeting participants did not believe that demand would increase significantly for future coin releases, with the possible exception of the coins commemorating the most popular former Presidents. Since the change, depository institutions have indicated that the new ordering period has improved the ability of their remotely located branches to order and receive coins by the release date, while accommodating their customers’ ordering patterns. As reflected in table 1 below, depository institutions have generally placed more than 80 percent of the total orders for each new release during the first three weeks of the special ordering period. The new ordering period accommodates these orders before the official release date. 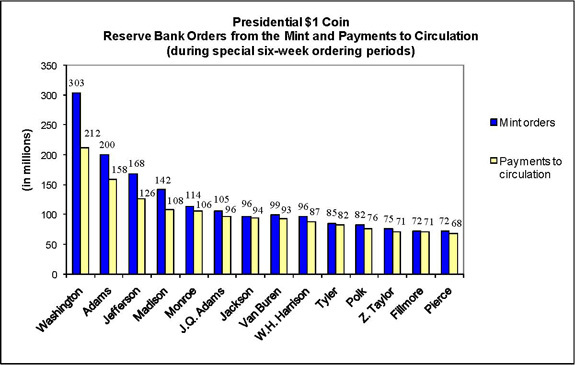 The Reserve Banks have studied detailed payment and inventory data for previous Presidential $1 Coin releases at the Reserve Bank offices and off-site coin terminals, supplemented these data with feedback from depository institutions about expected demand, and developed better forecasts for each successive release. The Reserve Banks have then actively managed inventories throughout the special ordering period for each coin, relocating coins around the country, as necessary, to meet demand. As figure 2 indicates, however, depository institution demand has continued to decrease. Because we have not seen an increase in demand, the Federal Reserve Banks' $1 coin inventories have increased significantly over time, even though improved forecasting and ordering practices have reduced the number of residual coins at the end of each new release period. The Reserve Banks hold the residual coins as inventory at their offices and off-site coin terminals. Additionally and more significantly, depository institutions have re-deposited a significant number of excess $1 coins with the Reserve Banks. As shown in figure 3 and table 2, previous $1 coin supplies, plus the excess $1 coins returned by depository institutions, elevated total Reserve Bank inventories of all $1 coins to almost $1 billion as of May 31, 2010, or about $932 million more than the Reserve Banks held before the start of the Program. Based on historical Presidential $1 Coin payments and receipts and current inventory growth trends, the Federal Reserve estimates that it could hold more than $2 billion in $1 coins by the time the program is expected to end. Because of vault storage constraints and insurance limitations at coin terminals, the Reserve Banks have been forced to spend resources in the past nine months to expand storage capacity to hold the excess $1 coins, with no perceivable benefit to the taxpayer. We expect that the Reserve Banks will need to continue to seek additional storage options to store the expected flowback of additional $1 coins through the end of the program. Note: the United States Mint has indicated that it paid to circulation $88 million Native American $1 coins through its Direct Ship program in 2009 and $23 million in 2010 (as of June 17). The Mint also indicated that it has paid to circulation a total of $57 million Presidential $1 Coins via direct shipments since the start of the Presidential $1 Coin Program (as of June 17, 2010). These data are not included in the above Reserve Bank payments to circulation. Note: the payments to circulation do not include the $1 coins that the United States Mint has issued directly into circulation. See note to figure 3. To gain a broader perspective on the management of commemorative circulating coin programs, we explored the experiences of other countries. We found that other major industrial countries have implemented very different processes from the United States for issuing commemorative circulating coins. For example, the Eurosystem countries have regulations specifying that all commemorative circulating coins should be concentrated on the 2-euro coins. Eurosystem countries have also limited the quantities of these coins that these countries may issue.7 Other countries, such as Canada, limit the issuance periods and continue to issue the traditional design simultaneously with the commemorative circulating coins. Some central banks (for example, the Bank of England and the Bank of Canada) are not involved in the distribution of commemorative circulating coins or do not accept the return of coins from depository institutions. These types of restrictions serve to minimize the number of excess coins produced by the mint or held by the central bank. Our first annual report to the Congress on the Presidential $1 Coin Program included a recommendation for legislative action regarding the "Sacagawea design" $1 coin provision in the Act.8 The Congress later reduced the Sacagawea production requirement in the Presidential $1 Coin Act with the enactment of the Native American $1 Coin Act (Public Law 110-82). The revised Presidential $1 Coin Act, however, retains a quantitative requirement for the volume of Native American $1 Coins that the Secretary of the Treasury shall mint and issue. The Reserve Banks' depository institution customers, however, have indicated that they have experienced very little or no demand for Native American $1 Coins.9 Given the lack of evidence to date that the Presidential $1 Coin Program will stimulate demand for $1 coins as a broad-based transactional medium, the requirement that a specified minimum number of coins be minted and issued without regard to actual public demand will continue to result in production and storage costs to the taxpayer without any offsetting benefits. 0.1 percent of the total 2-euro coins in circulation, or 5 percent of the total of 2-euro coins from the issuing country.